Dust off your acid-spitting revolvers and lightning-bullet sniper rifles, amigos - The Zombie Island of Dr. Ned will be coming to Borderlands on November 24th. Now don't get me wrong, Borderlands has quite a bit of replay value, what with its co-op treasure hunting action and boosted difficulty on repeated play-throughs, but you can only battle the Crimson Lance in the streets of Old Haven for so long before it starts to get a bit old. 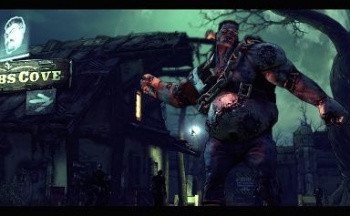 Thankfully, Gearbox is looking to freshen up the experience a bit with the game's first DLC, The Zombie Island of Dr. Ned (no relation to Fyrestone's Dr. Zed, as far as I can tell). According to the official press release, Dr. Ned's Zombie Island will let Roland, Lilith, Mordecai and Brick square off "against ferocious brain-eating zombies, carnivorous Were-Skags and more" all in the pursuit of sweet, glorious loot. Since, y'know, clearly an island full of the undead will have better equipment than the mythical lost Vault full of alien riches. At the moment, the announcement only mentions that the DLC will be available for Xbox 360 (800 MS Points) and PS3 ($9.99 on PSN) with no word about a PC release, but we can always hope that they'll make it happen, right? Oh, and that they'll get rid of the GameSpy requirement for multiplayer, because that's totally lame. But then again, PC gamers who want co-op zombie hunting action will have their hands full with Left 4 Dead 2, so maybe it's for the best.